In a recent article the widely held belief surrounding the number of black men incarcerated outnumbering the number of black men enrolled in higher education was refuted. The piece is titled "The myth that there are more black men in prison than in college, debunked in one chart". The author appears to believe through proving this assertion about prison and education ratios to be inaccurate either a point of great progress can be demonstrated, or an overstatement of calamity about the state of African American men can be corrected. "The Census estimates that approximately 18,508,926 people in the U.S. population are black males, of all ages...The Bureau of Justice Statistics' National Prisoner Statistics Program reports that in that same year, 526,000 were in state or federal prisons, and, as of mid-year 2013, 219,660 were in local jails, making for a total of about 745,000 behind bars"
To give a lens for viewing this data India is a country of 1.2 Billion people, the country in total only has around 380,000 prisoners. 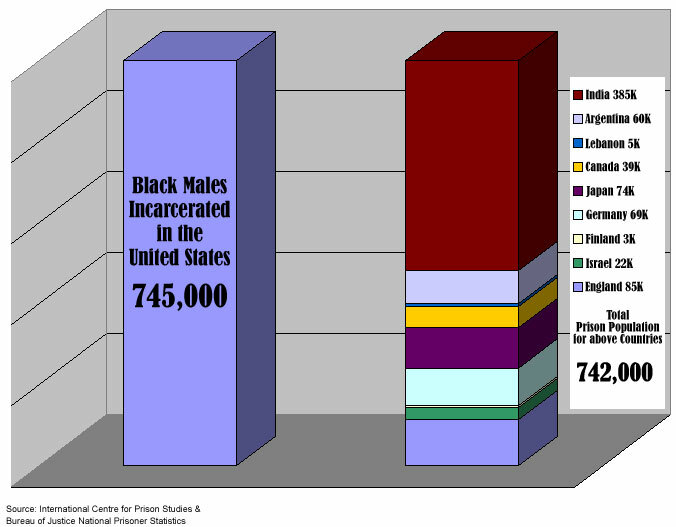 In fact, there are more African American men incarcerated in the U.S. than the total prison populations in India, Argentina, Canada, Lebanon, Japan, Germany, Finland, Israel and England combined. As stated by Nicole Porter in the piece "Politics of Black Lives Matter"
...countries have the policies and prison populations they choose. Between 1965 and 1990, a period during which overall and violent crime rates tripled in Germany, Finland, and the United States, German politicians chose to hold the imprisonment rate flat, Finnish politicians chose to substantially reduce theirs, and American politicians generally enacted policies that sent more people to prison, along with lengthened prison terms. Today in the United States there are approximately 18 million black men, and nearly 161 million women of all races. 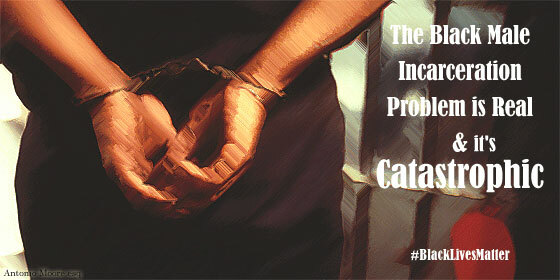 According to the Sentencing Project the total number of women incarcerated in America is about 200,000. Even more shocking despite the population of black men being about a tenth the size, there are nearly 4 times as many black men incarcerated in comparison to women of all races in the U.S.
To give a more appropriate contrast than just black men in college and black men incarcerated, lets look at the debated education vs incarceration reality for white women and black men comparatively. According to the Census in total there are about 8.5 million white women in college, and there are just 60,000 white women incarcerated. For black men the numbers are as listed above, there are about 1.4 million black men enrolled in higher education, and a cataclysmic 745,000 behind bars, with another large sum on probation and parole. So in the end the contrasting of college enrollment vs. incarceration is not the key comparative. While it is part of an analysis, only by applying it with more depth can we see a fuller and more accurate picture. It is more important to look at these rates and be honest about the advantaged, and disadvantaged. The key is that as then presidential candidate Barack Obama stated "We have more work to do..." We can only take steps and start this work by asking the hard question of why historical differences in both opportunity and misfortune have left us such a disparity in access to opportunity for all.